Introducing Your Puppy To Familiar Dogs/Puppies This is the perfect time to call on your friends with dogs. But it is crucial to look for dog-friendly and puppy-friendly dogs. You do not want your puppy to be a guinea pig in finding out if another dog is puppy-friendly. Puppy-friendly dogs are dogs who can tolerate a puppy jumping on their head, running around in circles, and even barking in their face. These puppy behaviors are very inappropriate dog greeting behaviors, which is why you are going to teach your puppy the proper skills in dog greeting. However, you want to help make certain that if a puppy mistake happens, the other dog can tolerate it and not hurt or scare your puppy. When you have found a puppy friendly dog the ideal meeting place will be outside. Pick a neutral location which can even be just a few houses down from either one of your homes. Plan on meeting on opposite sides of the street. With your puppy leashed to his front clipping harness, and some high-value dog treats in your pocket start to walk up and down the street about 3-5 houses in length. At the same time, your friend is doing the same with her dog on the opposite side of the street. Once it seems like both dogs are unresponsive to the other dog, have your friend and her dog come over to your side of the street 5 houses away and start to walk in the OPPOSITE direction. As your friend starts to walk, you walk your puppy behind. After a couple of houses, both of you change directions, so her dog is following your puppy. When each dog is once again not concerned with the other, start to close the distance between the two dogs until eventually your friend’s dog gets the opportunity to smell your puppy’s rear area. While this is happening, slip your hand inside your puppy’s harness and feed him treats. This process will do a few things. First, it will help your puppy keep 4 on the floor and focused on you. Once a little sniffing has occurred, switch smelling positions and allow your puppy to smell the other dog’s rear area. Once they both feel comfortable with each other, allow them to sniff each other for a few seconds, then call your puppy to you and give him a treat. 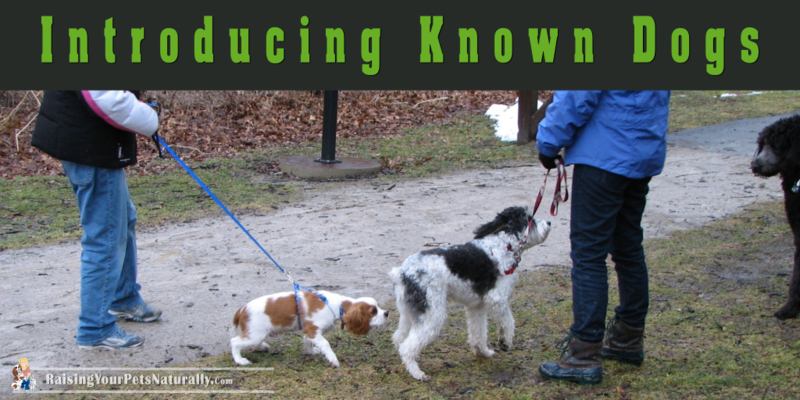 This will allow your puppy to learn how to come off of other dogs, and will help keep the new canine interactions low key and more likely successful. Repeat the process of allowing the dogs to come together for little sniffing, and then calling them off of each other. Building the length of time they get to spend with each other. You can repeat this process, but more speeded up with each following interaction with the same dog. Each time you meet a new familiar dog, continue with the steps outlined. You will likely also be able to speed it up as your puppy learns the routine you are teaching him. But always continue to call your puppy off of interactions and give a high-value treat. This will come in handy in the future, so let the training begin now. If your puppy is uncomfortable at any time, remove the two dogs. Do not keep your puppy there if he is not happy. If either dog has any issue with the food or reacts in an unfriendly way, remove the dogs from each other. Going for walks together with other dogs is a great way for your puppy to learn to interact with other dogs. There will likely be a time in your puppy’s life that he will actually have the opportunity for a playmate for the afternoon. Provide the same introduction as above. When it is time to retire to your home or another friend’s home with both dogs, walk into the house or fenced in yard one dog after the other. When your puppy is playing with other dogs, it is important to supervise play sessions to ensure they are playing safely and appropriately, so you must watch and intervene when needed. Appropriate play can quickly get out of hand and turn into aggression, particularly for dogs during adolescence since they are in the learning stages of self-control. This is one of the main reasons for teaching your puppy how to come off of other dogs. During appropriate play between the two dogs, occasionally call your puppy to you and give him a high-value treat. Do this before either dog gets too aroused and rough to keep both dogs’ arousal in check by creating pauses and breaks in play. Over time, your puppy will likely learn how to take play breaks on his own. Tip: Listen and watch your puppy during play. To help you determine if the play is tipping toward over arousal look for changes in play style, louder, rougher, body slamming or more chaotic are some examples. If there is a spat during play, try not to get too worried. Calmly break them up and remove them from each other. 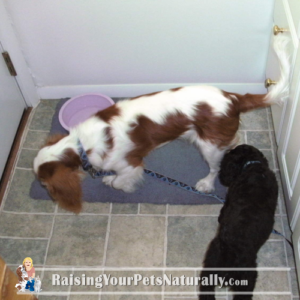 Attach each dog to their coordinating leash and harness for a little time out and rest. If you have enrolled in a good puppy class, or are working with a good private dog trainer, they can help you with understanding dog body language and will be able to help guide you down the right path. It is always a good idea to have a qualified coach on your team. Article from Proactive Puppy Care: Preventing Puppy Problems. 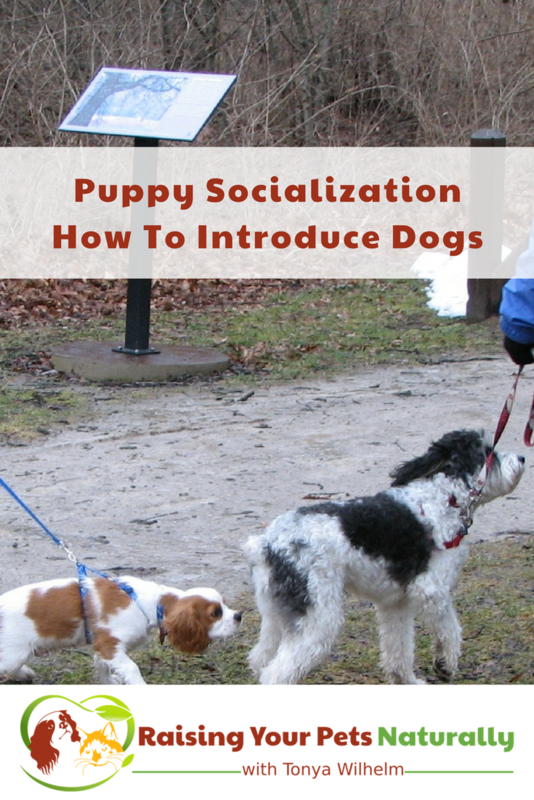 Do you have a social dog or puppy? Tell me in the comments.